Eat on $30 – Day 1 – A slow start…and a giveaway!!! Last February, I took on the challenge of eating on a budget. A very tight budget – $30 per week. I did it for a variety of reasons. The first being…times are tough for a lot of folks these days. Living on a budget is a way of life for many, many folks. Secondly, hunger issues are the cause I most believe in. As a person who knows the joy of food and the memories that amazing meals can create, the notion that people go hungry in this country (and across the globe) is insane to me. The national average for those receiving food assistance is between $21 and $24 a week. Even the simplest food for us "food people" is luxurious for most.We lose sight of that. So I lived on $30 for a week…and I didn't even spend it all. I came up with inventive ways to cook simple ingredients. I used every bit of what I bought. No fancy coffees. You know what? Those are things that I have carried with me to this day – I can count the number of times I've gotten a designer coffee since then on one hand. Those are small changes but it's hard to look at a latte when you think…"That's someone's food budget for a day!" At some point during the year, 1 in 5 Americans receives food assistance from 1 or more of the 15 programs providing help. In 2009, the Supplemental Nutrition Assistance Program (SNAP) will help feed 31 million people per month. The average monthly benefit? $101. Between March 2007 and March 2008, the global price of food rose 43%. 1 billion people – 1/6th of the world's population – live on $1 per day. As someone whose blog gets a good bit of traffic, I got great response from people during the last challenge. It wasn't enough. My voice isn't loud enough. 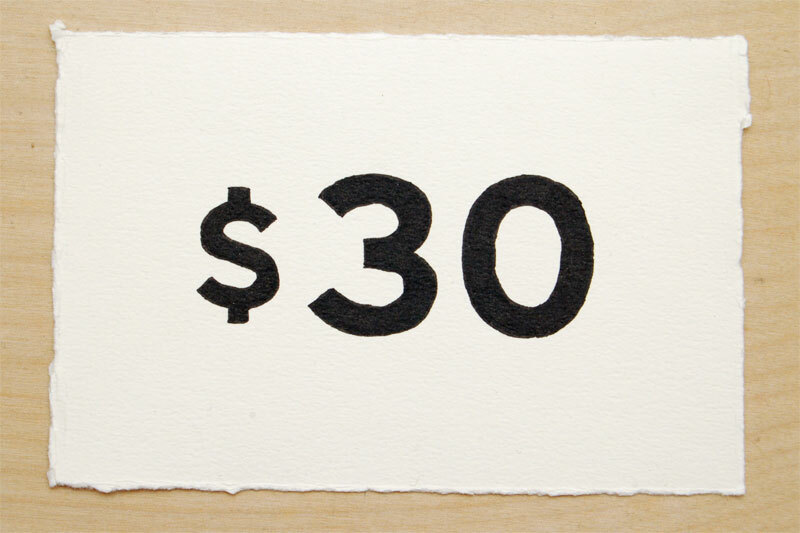 So I put the call out to folks in the blogsphere to join me in the Eat on $30 challenge. The premise is simple – eat and drink for $30 a week. Salt, pepper, butter and oil are freebies – everything else you have to budget for. Talk about your week, the food you cook, your feelings about the challenge. Blog. Tweet. Post your status on your Facebook. Betty Joan is a fellow Atlantan who blogs at Trouble With Toast. She's actually been doing it THIS week but will be posting about her experience while we're all doing the challenge. You can find her on Twitter @bettyjoan. Robert – @rdyson on Twitter – is also taking part from Atlanta. Check out his blog here. Mike – who took part last time and made a blog especially for the challenge – will be doing it again. You can also follow him @boutte. Zach is kicking off a new blog with this challenge – Mise en Face. Follow him @drzachary. Could you please post your grocery list for the week for $30.00? Good luck. I remember how difficult it was for us back then. I’d give it another go this time but my schedule is a bit out of my control at the moment. I am sooooo excited! I’m meal planning this afternoon and shopping tonight. Since there are three of us in my home, I’ll be working with $90. Surely we can do it…I think. Excited (and a little scared! )….let’s roll! I have to say that it can be done. My daughter and her 3 roomates have been eating on a budget of $25 a week for the past two years. They shop and cook together. She said that by doing this she has saves a lot of money and she says that they eat well. What a great idea. Wish I could participate, but I’ll be traveling this week. What a great way to raise awareness about hunger issues. I too love this idea. Good luck and I’ll be watching and reading. I am very impressed with what you are doing here. I am wondering if you will be putting together a list of the recipes you use or at least a list of the food you will eat during this challenge. I work with inner city teens and their eating habits are terrible. If there was a reference you could go to (and not have to be as food knowledgeable as the food bloggers are) that would help teach young people how to eat cheaply and healthy that would be a great benefit to many of us running programs of this type. Thanks! Hi! I love this idea but unfortunately I just saw your post. I’ve tried to cut back my budget as well, and we’re wasting less food as a result. We’ve also tried using less meat and upping the veggies, especially those that are in season as they are less expensive. Good luck, and I’ll be reading along with you! That’s the hope is that we can help show people that it IS possible to eat well (as in not as many processed food/foods with real nutritional value). I will be cooking today and the rest of the week and am going to do my best to include a recipe in every post. Please see all the other people that are taking part – many are also cooking and posting about it! This is an exercise not only to get the word out about how much food we waste and how we take so many of our shopping habits for granted…it’s also a reminder to myself that I need to eat everything I buy and be more conscious of spending and consumption. Here’s a good tip–befriend the marketing director at Fifth Group Restaurants. He can always get you a great dinner at a discount! ;-) http://fifthgroup.com. Seriously, tho–good luck! I had already done my shopping & meal planning for the week when I heard about this – but I am going to give it a go for next week (Fri 10/16 – Th 10/22). Is this $30 a week per person? My husband and I are foodies and we eat like kings on $60 a week for the two of us. Our staples are probably the same as yours, rice, milk, beans, baking goods, ground beef, etc. and we still take advantage of wonderful in season produce. Eating on a $30/week budget is plenty easy if you shop thoughtfully and are willing to buy big (whole pork tenderloin) and pack it away in portions for the freezer. I don’t know if you see old comments, but I loved reading your take on your 30 dollar project. I spend $3.33 a day on food ( or 100/month ).. It started when I was laid off from my job. Fast forward several years. I have started my own business and am keeping things as frugal as possible. When you said that it was hard to justify buying coffee out because that was someones daily food budget.. I know what you mean! I do drink coffee though and do not include it in my budget. I am down to one cup a day from drinking around 3. I try not to spend much more than $30 a week for each person in my household for all meals, but would love some new ideas and recipes! !